You can find Emily on Instagram, too! And she has a surprise for you: She’s giving away one copy of the 2019 Simplified Planner plus a copy of each of her books, A Simplified Life and Grace, Not Perfection ! I had a wonderful conversation about friendship recently with Sister Theresa that I’m so excited to share with you. It’s such a grace to talk about this very important topic with wise women, and we hope you enjoy listening in to our podcast! Today in my podcast, I sat down with Nathan Clarkson and talked about why good stories were so important to him as a boy and how they helped him find a vision for growing into a good man. One of the pleasures of hosting a podcast and be engaged in ministry is the sweetness of getting to rub shoulders with women who deeply love the Lord and are kindred spirits. Ellie Holcomb is such a woman. Her deep love for God, His word, a joyful reverence for life and a deep love for children combined to give us such a wonderful time to visit recently. A heart that is filled with and informed by Biblical convictions does not just happen. It is shaped intentionally over many years, day by day, circumstance by circumstance, repeated literally thousands of times. It all starts with a mom who is willing to train and disciple her children and to pay the price of commitment, time, and winsomeness and preparation over many years of time. When we learn to give value to others by serving them, we will be much more likely honor God--and honoring God is the first commandment. Loving God and honoring Him with our whole hearts is the starting place for appropriate worship, which says He is worthy of our praise and service our whole life long. Honor is a heart attitude. Today, Nathan and I talk about what it looks like to be a good man and how to shape your boys’ hearts so that they will grow in their self-image to wanting to be a good man in their generation—a good man who is willing to be a part of bringing God’s goodness and light and morality back into a culture that longs to be led and taught. When I live in true integrity of following hard after Him, my children find the real him living in my home--not philosophy or curriculum or denomination or rules--the the real Christ who lays down His life, shepherds the sheep of his fold, the servant king who cares about real people. True personal integrity comes from following hard after Him and obeying and loving obeying what He has called me to do. God cares so much for you and all of the burdens you carry and wants you to know He has compassion and sympathy for you. Just know that your perseverance in faith and being faithful pleases His heart and He understands how you feel. Do not feel guilty about feeling bad for difficult things--that is a proper response. But choosing to take joy and seek to light candles in the darkness so to speak will help you make it through. And the hope that every day of your faithfulness matters will keep you going forward. When our hearts are surrounded with fear and discouragement in the storms of life, let us look to the face of Jesus, our king, our savior and our Lord. He is with us. He will not abandon us. He will carry us through. Today is the best time, to believe, to hold fast, to worship by faith and to rest in His strength. As mothers, I believe, we are called to take this lesson of grace to heart. Like Jesus, we are to draw our own children to a life apart from the rest of the crowd. Each of us is designed by God to whisper his words to the hearts of our children so they will feel the call of God in their own lives to become fishers of men. Episode #173: What Value Does God Place on Children? Episode #171: You Could Be a Hero, too! Nurturing my children was not always a planned part of my normal day, but sometimes the spontaneous times of training and instruction were the best times. Set kid-sized goals. Training your children how to set goals, even at a young age, is giving them early practice at one aspect of what it means to be a disciple of Christ. Kristen Kill is a woman transformed by the delight of God. She is passionate about encouraging women who feel stretched thin with the truth that, even in the tension, God is singing over them with love. After spending the last seven years in the hustle of New York City, Kristen and her husband, Josh, are learning to go slow as they raise their five kids in the Pacific Northwest. Her days are filled with homeschooling, walking her slightly anxious hound dog, and putting off the cleaning for one more day. Find Kristen writing at kristenkill.com and follow her on Instagram @kristenkill. If you would like to see what Holly is up to, follow her at storyformed.com or find her on Instagram @storyformedhome. To keep up with Glenn's latest musings, follow him on Twitter at @gpackiam. You can also find links to his resources on glennpackiam.com. Lifegiving parenting is not about changing the culture we live in but about being a counterculture to it. It’s not about creating a comfortable Christian subculture insulated from the surrounding world; rather, it’s about being the kind of lifegiving home culture that will stand as a testimony of God’s biblical design for family to a lost world whose sandy foundations are washing away. We have had such a great time interviewing different parents asking them to share some of their best ideas and advice about being a parent who raises their children for Christ. Today is our first such podcast. We hope you will enjoy this series and glean from the many ideas shared in the next two weeks. You will love Susie Davis. She is a seasoned mom, an author and loves to encourage those in her ministry. You will be refreshed by our time shared on this podcast, Thanks, Susie. Join me in my podcast today where I discuss the way to contentment in marriage, how to build this legacy for a lifetime and why God considers your worship of Him as a reflection of how well you choose to love and live in harmony with your spouse. Discipleship and mentoring took place daily at our table, because of our intentional commitment to inform their values, to reach their hearts with truth and messages from the heart of God. The lifegiving home must start with a heart that says, "I will be the hostess of life here within these walls to serve all who come here so that they may taste and see that the Lord is good by being here with me." Our newest book, The Lifegiving Parent, is all about the ways we walk along the path of life with our children, encouraging them to find life in God. Available now for preorder! The starting point for all of us, first of all, is to learn the habit of living in the reality of God's view of us, His very generous and gracious love for us at every moment and to avoid thoughts of condemnation, mess and all. In the podcast today, you will hear my own story of how out of control I was of my life when my children were little and we had moved to a very remote country place to start our ministry. You will learn about the circumstances in which I had to yield my impossible life into God's hands and by faith believe that this awful place was exactly the place he wanted me to be, the place I was to cultivate life in my own desert. The next 10 weeks, I will be leading all of us through a podcast series based on my book, Own Your Life and the Bible study guide and planner. It is my hope that this series will remind all of us about the ways God desires each of us to find our place in His story, meaning through our every day and the way to live life in such a way that we can follow along His path of love, purpose and fruitfulness that will last for eternity. I will be discussing the vision of life as well as the details of life that happen every day. Join me and I hope it will be of great encouragement. Episode #125: Discovering That Beauty Changes our Lives and the Whole World! We're all chasing rest and beauty and delightful interludes, aren't we? But why? What do we crave at the root of that desire? Today, Sally and Kristen dive into the third and final podcast in the series that accompanies Kristen's new book, Finding Selah: the Simple Practice of Peace When you Need it Most. They share about the longing for beauty that we all have deep in our souls and discuss the only way it can ever be satisfied. They talk about real ways that we can practically grow in peace in our real lives, and the reason they are so passionate about sharing delight and visible joy with their children. Do you want to change the world? It begins with discovering beauty that changes your whole heart! -How to take action and allow a practice of peace to sink deep into our lives. -God's heart for us to receive the gifts He gives us with joy. -The fact that rest is often active and often requires that we yield or surrender. -Activities that are restful to each one of us and how you might implement them in your own life. -The transformative effect of rest in our lives- and the way it equips us to pour out our hearts to others. -How we cultivate spaces that knit beauty and peace into the lives of our children, and all those we influence. -Finding the root of all beauty in Jesus, and learning to trust Him and be satisfied in our relationship with Him as a pattern that shapes the rest of our lives. -Why its so important to talk to give our children a home, a table, and an education that all speak life- that all give them a vision and a picture of heaven- that guide them to the heart of God. -God's provision of his people when they had great fear and anxiety. -The gifts of our "miracle babies" and the way God softened each of our hearts through the joy of motherhood. -How embarking on new experiences requires new muscle to develop in us. -What C.S. Lewis spoke of when he called earth "The Shadowlands"
-How to develop a vision and imagination for God that will sustain us throughout our lives. -How do we develop a kingdom vision that will sustain us and our children in this place? -What we believe about God and his story for our lives and his vision and story for the world and the part we play will be our foundation for the way we live each day. -Stories of how each of us have shared the delight, enjoyment and mission of God with our children will shape their view of our family and of God. -Trials we have faced and how they have helped to define our character and how we have seen the way they have prepared us for even greater things. -How we have learned to have interludes of beauty and delight with God in the midst of all our difficult circumstances. -A story of art that captured Kristen's heart and shifted her understanding of what God saw and was doing in her life. -The way God’s song and beauty and art awaken our hearts to Him. - How we can encourage others through the sharing beauty and the truth of God's word. -The history of the Psalms and music in the church. Waiting on something has taken up most of my life. Waiting for answered prayers that occupied my heart and hoping that God was paying attention. In this podcast we will talk about the difficulty and sometimes pain we have when we are waiting for answers from God. We will also talk about the value in learning to wait as well as the ways God blesses beyond the waiting time we are in. God is in control--we must humble ourselves to let Him be God and king over our lives to wait well. Faith is believing when we cannot see--choosing to believe when we absolutely do not know what is happening or what will happen--we choose to believe in God. As we ponder the countless thousands who have engaged in our ministry through the years, through conferences, through the publishing and launching of 20 books and Bible study guides, the development of an online ministry, our blogs, podcasts, small group and international ministries, the Bible studies and conferences that are taking place all over the world, we are humbled by what God has done. *My time with a dear friend, Terri Moon, and reminiscing about our lives with our children who have grown up together. *Why joy is a healer and why a joyful heart is good medicine. We think that Christmas is a great time to share books as gifts because they also bring healing and inspiration to those we love. So, we are giving away 3 books to our readers for Christmas. The Value of Learning to Wait--practicing patience takes time and courage but it produces the deepest most heart gratifying fulfillment. 1. I talk a legacy of beauty and how it passes to the future generations. What we practice grows deep into the lives of the next generation. 2. Looking at the biblical subject of waiting and how it is a process that builds the things we invest in into the story we leave. 3. Learning to stand back and get the long view of life, and working with the end in mind and believing by faith that you are building something that will matter. 4. Cultivating a Community of Great Souls--Life with Sally membership is a way to have discipleship and spiritual mentoring online as well as leadership training. Episode #115: Adventures in Scotland, Stories of Old, Happy Thanksgiving!! Traveling to Scotland after being in Oxford with Sarah and Thomas all week has been such a refreshing week. Learning the stories of those who have lived brave lives in these places has been inspiring. Join Joel and Joy with me today as we tell of the history of St. Andrews, talk about the great food in the cafes here, and share the fun of our time together here. Be sure to look for Joy's blog, Joyclarkson.com and weekly podcast, Speaking with Joy. Enjoy the Wexford Carol as Joel arranged it and find the music at Amazon (Midwinter Carols by Joel Clarkson) and other places where music is sold. The ways you learn to respect the learning process of your children, to admire their ability to think, to engage them in great ideas and thoughts will give them a chance to digest great convictions that will shape their faith for a lifetime. The table is central to the everyday moments of our lives, even when we are busy, or find ourselves stretched in the midst of seasons that require much from us. Feasting goes on! It is also the anchor to much of our milestones and family celebrations. In this episode, Sally and Kristen discuss Chapters 7 and 8 of the Life Giving Table and offer their own tips for how to create for simple feasts when life is overwhelming or we are short on time. They also share how each of their families create traditions with food and fellowship to mark life's special moments. -How to stop waiting for the ideal and learn to enjoy the moment. -Our favorite staples, recipes and tricks for feasting simply or when we have little time. Mark 6:31 "Then Jesus said, “Let’s go off by ourselves to a quiet place and rest awhile.” He said this because there were so many people coming and going that Jesus and his apostles didn’t even have time to eat." Table-Discipleship Principle: A wise discipler must make space for rest and beauty in the midst of life. Numbers 6:24-26 "The Lord bless you, and keep you; The Lord make His face shine on you; And be gracious to you;The Lord lift up His countenance on you, And give you peace." This little podcast is just me sharing some thoughts that have been passing through my brain. Hope you are encouraged. I hope that you are encouraged by today's podcast. Let us know what you think below. Discipleship Principle: Practicing the Rhythms of life regularly with your loved ones creates a secure feeling of belonging- of being welcomed and able to share convictions and faith in a community where one belongs. -Navigating squabbles at the table and teaching our children how to consider one another wisely. Acts 2:42 NASB"They were continually devoting themselves to the apostle's teaching and to fellowship, to the breaking of bread and to prayer." Luke 24:14-15- "They were talking with each other about all these things which had taken place. While they were talking and discussing, Jesus Himself approached and began traveling with them." SHAPING THE MIND AND HEART THROUGH REPEATED DISCUSSIONS ABOUT TRUTH, BEAUTY, AND RIGHTEOUSNESS AND ENGAGING IN THESE IDEAS REGULARLY SHAPES CONVICTIONS THAT LAST A LIFETIME. Nathan and Sally wrote a book called Different: The Story of an Out of the Box Kid and the Mom Who Loved Him. In this episode, they discuss the long term pathway of walking through all the stages of life with a child who will always deal with his or her issues and how to live this life with grace, patience and sustainability. You will find encouragement and sympathy for your own life and inspiration about how to live this puzzle of life with contentment and Peace. Table-Discipleship Principle: Creating an environment of beauty, comfort, and acceptance cultivates hearts that are open to your messages. Creating a life-giving table begins with a vision for cultivating beauty and a hosting place for others. In this episode, Sally and Kristen dive in to chapter 4 of the book, The Life Giving Table, to share stories and encouragement that will help you develop your own vision and sustain it through a commitment to your original ideals for years to come. Music is one of the defining cultures of the Clarkson family. A handful of talented musicians have permeated all the seasons of our family history, as we listened together, sang along in the car, filled our walls with the melodies that tied the strings of our hearts together. Our friend, Andrew Peterson, is one such singer songwriter and close to all of our hearts. I am so happy to have him as a guest on my podcast today. The Petersons are kindred spirits and fellow "creatives" in so many areas. They love to feast, talk, read, sing, and create a rich life with a warm welcome to all who would join their community. I am happy to introduce some of you to Andrew's story, his music and his books, though I am sure many of you have followed him for years as we have. I know this podcast will encourage you. Clay is a long time supporter of all things Andrew and we have both loved attending Hutchmoot, a gathering of artists, musicians and creatives for many years. Every year we draw closer to the friends we have found in this community. How can our table make Christ real to those who share life with us? How can it inspire them to serve him their whole lives? In this episode, Sally and Kristen begin a series on discipleship and invite you to discover how feasting invites you in to celebrate the delights, creativity, and personality of God. -The example of the Life of Christ- feasting, caring for those he came in contact with, feeding them, preparing a place for them, touching them, and desiring intimate connection with them. -How feasting fills spiritual, physical and emotional needs. -The meaning of sanctuary and why is it important to create one for your family. -What qualities of the table aid in reaching the personal harvest fields of our lives. -Coming to the table is not just about the physical act of eating, but about sharing life as God designed and gave it to us. -Approaching the table with an intentional purpose and expectation with shape how we cultivate it. -What we can do to protect and set boundaries for our tables. -Why the table is just like a beautiful piece of music: carefully arranged, thoughtfully directed, and passionately played. I am so excited to share this Mini-Podcast with you. Dr. Michael Ward and I sat down quickly together and recorded this conversation after a quick breakfast the morning I left for Nashville. I know you will enjoy hearing his lovely accent and his insight about stories, an inspirational poem and C.S. Lewis about table time. Our celebration of the Life-Giving Table begins this week! In this episode, Sally is joined by Kristen Kill and they both share why the table is important to them, and why this book is really about something far greater than merely dinnertime. Then Sally is joined by her daughters, Sarah and Joy as they share memories, insight and encouragement about the Clarkson family table, traditions and the heart of why it all matters most. Join the first day of celebrations with us as we celebrate the launch of this new book and stay tuned all week for wonderful giveaways and surprises right here! The first of a two part series, Sally and Kristen will encourage you to understand your identity in light of God's view of you, which is a stability that will serve your children through their whole lives. -How surprising circumstances in our own lives caused us to re-imagine our roles and personal convictions this summer. -How God has called us to be mothers because He intends for us to be a part of His kingdom work. Building souls, enriching minds, giving a sense of confident morality, inspiring a heart to believe in the story God has for them to tell is the way that healthy souls are shaped. -Why a sense of cohesive belonging is significant to your child. -Why you can’t become someone of eternal significance if you don’t know who you are and where you are going. In this episode, Sally is joined by her daughter Sarah and they discuss the deep roots and moral imagination and character that develops through books. They discuss the gifts cultivated by a reading life, and the capacity to pour those gifts back into the world as a result. 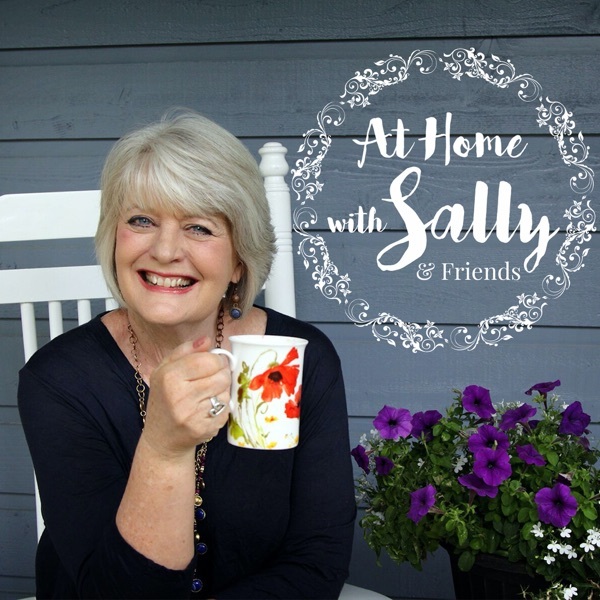 Sally and Sarah will inspire your understanding of the importance of books as central to the rhythms of home life and our interior souls and personhood. Then Sally is joined by her friend, Terri Moon who shares about the gift of music and how to help our children have a love of classical composers, and some of her favorite books to share with your children to introduce them to music. "In everything give thanks, for this is God's will for you in Christ Jesus. -1 Thessalonians 5:18"
Do your children hold wonder about God? Do they have an imagination that allows them to enter into the mystery of all He has made and all He has done? A Grateful heart is a humble heart, one that does not demand, but receives and then looks for how to give again to others with joy- but it begins by understanding the wonder of being a child of the God of the Universe and experiencing all of the goodness of God's world as a gift. In this episode, Sally and Kristen discuss how to protect and preserve a sense of wonder in our children, how to cultivate daily habits of thanks, and what it looks like to embrace God's will for us to "rejoice always," regardless of circumstance. They share about what it has looked like in their own homes to raise children who are content, how to battle the demands and entitlements of modern culture facing children and parents alike, and how God has used unexpected times of difficulty to build gratefulness into the culture of their families. -Recognizing Grace in our own lives and serving others from the overflow of what God has given us. 1 Thessalonians 5:18- "In everything give thanks; for this is God's will for you in Christ Jesus." James 2: 15-16- "Do not love the world nor the things in the world. If anyone loves the world, the love of the father is not in him. for all that is in the world, the lust of the flesh and the lust of the eyes and the boastful pride of life, is not from the Father, but is from the world." 1 John 1:7a- "Walk in the Light as He[God]Himself is in the Light." Episode #66: Patience and Love Win the Day! Episode #61: Grace and Peace to Your Christmas Week Moments! Sally Clarkson and Kristen Kill are sharing about the myths of motherhood that they struggled with as they celebrate the release of "Hoodwinked", a new book for moms by their dear friends, Karen Ehman and Ruth Schwenk, that is confronting modern motherhood myths with the truth of God's word!